So today I’m going to show you some ‘Peacock Holo Powder‘ in option LG-04 (sent to me by BornPrettyStore). But if you follow me on Instagram this’ll be no surprise as you’ve already had a sneak peak at it! The powder comes in a screw-cap tub within a little bag, and at first I was shocked by how little there was – I genuinely thought it hadn’t been filled properly. But! Upon looking again at the description it does state 0.2g so actually that’s about right. You will need a no-wipe gel top coat to be able to use this powder as it won’t ‘stick’ to normal polish. I gave mine top coat 25 seconds curing time leaving it just very slightly tacky but safe enough to touch without leaving marks. It is also suggested that the powder be applied on top of black polish so that’s what I did. I decided to test it on a lighter colour and it still works perfectly well! It gives it a slightly different under tone. (To reiterate just make sure you’re applying the powder to a no-wipe gel polish or regular polish that’s been gel top coated.) Unlike other chrome powders I’ve tried, this one is very easy to control. It’s not as messy in it’s application meaning it doesn’t end up sticking to your skin or cuticles – no clean up, no latex barrier bonus! I chose to top coat the powder with my usual, Seche Vite, which has a terrible habit of melting metalics, foils and chromes but it did an amazing job at staying strong. If anything top coating the powder made it sparkle and holo even more, you can’t deny that that shine ^ is awesome. For one last test I chose to use a blue base. I think you could have a lot of fun trailing this powder on loads of different colours, and I don’t think any of them would come out dissapointing. Has anyone else used this powder, what were your results? I really could have sat and looked at my nails all day. The ‘Peacock Powder‘ is amazing and it looks exactly as it’s described. At first the 0.2g may seem disappointing but a little goes a long way, it applies well and it’s at a very reasonable price. 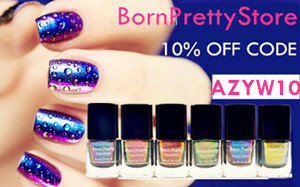 If you’d like to try this product or anything else from BornPrettyStore, use my code AZYW10 to receive 10% off any full priced items in your order.